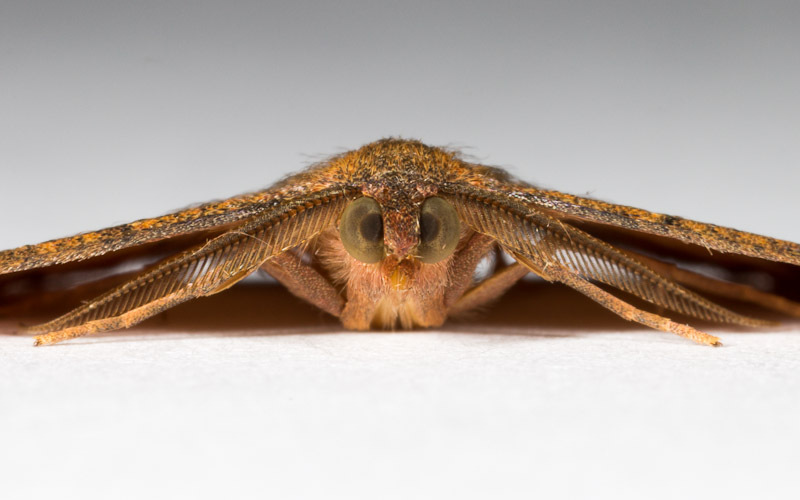 Being National Moth Week, I have every excuse to post about one of my favorite subjects. Admittedly, I get more excited about caterpillars, but I enjoy seeing the moths that most of them become. Back at the end of April, I was distracted by something while going to check the mailbox. Actually, I’m often distracted any time I venture into my yard, but that’s kind of the point of having one for me. Anyway, some large hollies form a hedge along part of my driveway. I spotted a caterpillar dropping from from the holly to the ivy beneath it. I grabbed it for a closer look and started scanning the holly for others. I quickly found another one and brought them inside for rearing. Less than a month later, I was rewarded with a Black-Dotted Ruddy, Ilecta intractata. The common name refers to the four black dots, one centrally located on each wing, which help identify it. The plumose antennae identify this specimen as a male. 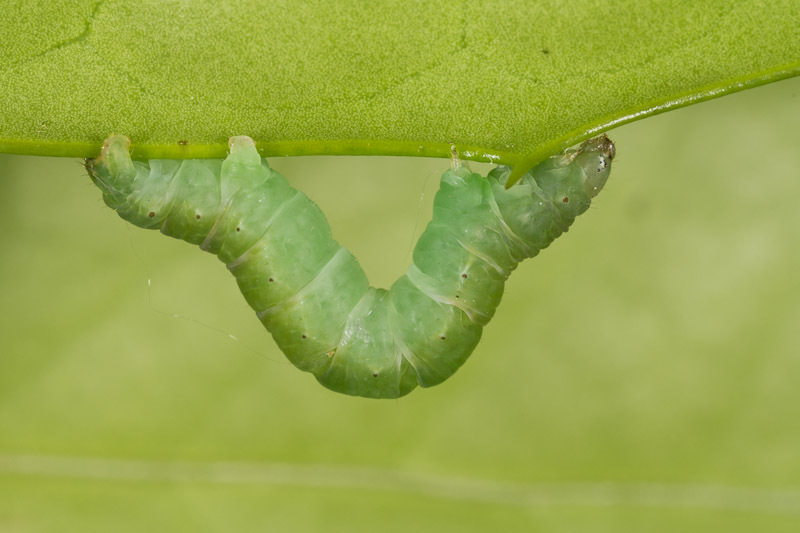 The caterpillars were plain green, which camouflages them well in holly foliage. Because of their plain appearance, I figured they would be difficult to identify. As it turns out, if I’d just cross-referenced the food plant, I’d have identified them pretty easily. 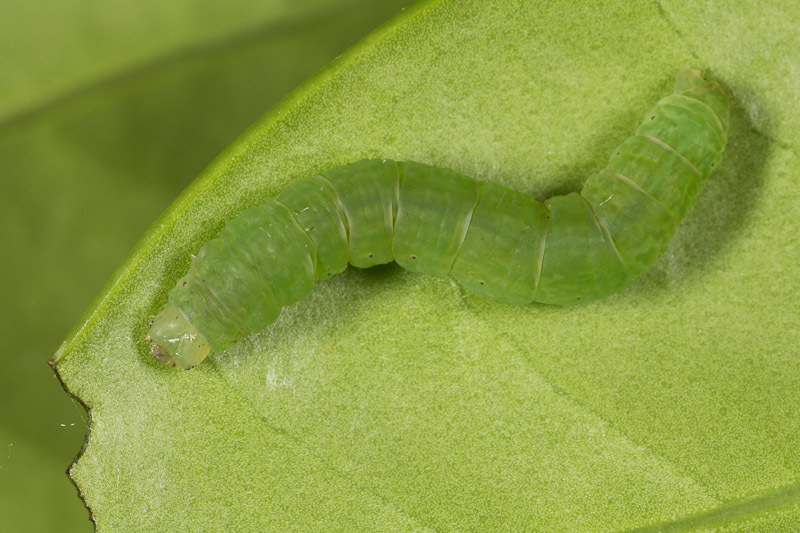 The caterpillars are in fact known as Holly Loopers. Demonstrating the source of its common name, looper. They feed exclusively on holly, but don’t seem picky about which variety. I have a different type of holly in my backyard, and I found a dozen or so feeding on it as well. In fact, it was difficult to find a leaf that didn’t show evidence of their feeding behavior. As they feed, they notch out deep cuts. 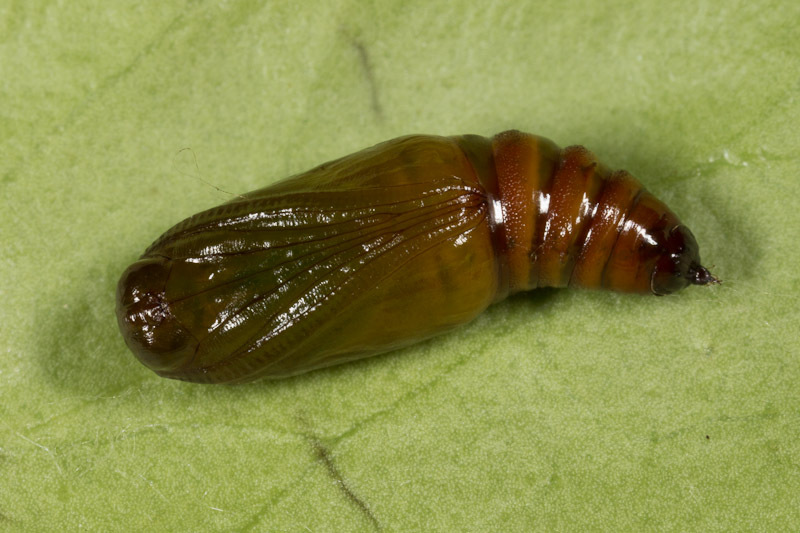 It didn’t spin a cocoon, so it probably pupates in soil normally. That would explain why it was dropping from the holly when I first encountered it. 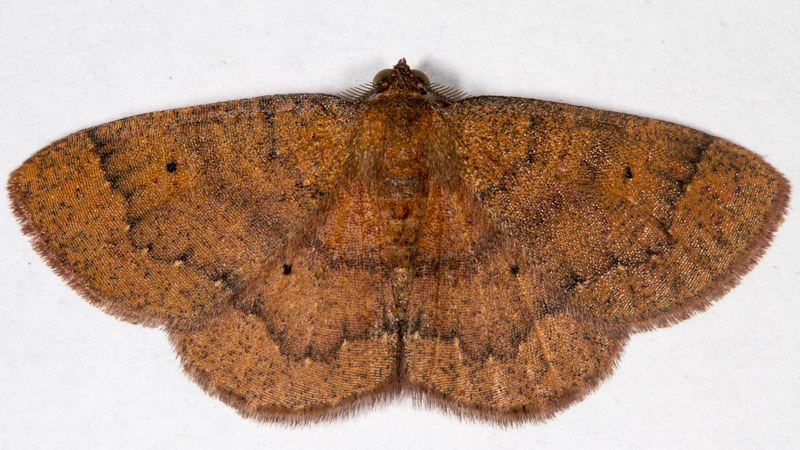 Here’s hoping that you’re distracted by a few moths this week. Just leave an outdoor light on for them, and you’re sure to be rewarded with something interesting. by Charles V. Covell, Jr. This entry was posted in Featured Creatures. Bookmark the permalink. 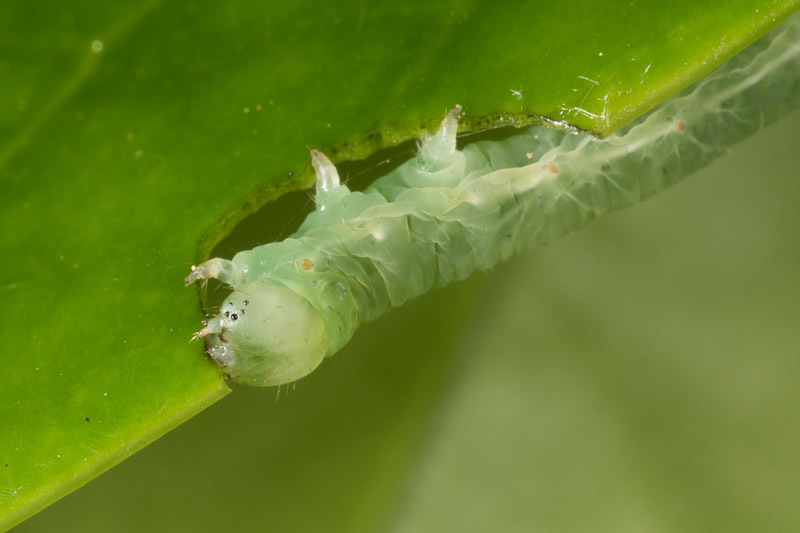 My daughter and I had the same experience today, seeing a tiny caterpillar drop by an unseen thread slowly down from a holly bush and I was curious what it was. Thanks for posting. We are in Seattle and it is April 17th, so interesting that you saw yours in April too.